KATHMADNU, Oct 05: Nepal was promoted in 40th edition of IFTM, held in France Paris by Nepal Tourism Board along with several Nepalese travel trade companies from 24-28th September of 2018. NTB along with the private participants disseminated information on current tourism situation and connectivity options to the continuous stream of visitors. An extensive presentation of multiple videos was displayed on TV screen on the stall throughout the fair. Around 35,000 industry professionals, demonstrating the vitality and energy that characterize the global travel and tourism industry, attended the 4-day event. The fair offered multiple faucets of travel segments -leisure, business and MICE with a dedicated program for each and a comprehensive experience for trade visitors. Nepalese stall earned enthusiastic and attention from business, media and general visitors. Apart from the general curiosity on the regular tourism products, the Nepal delegates responded several inquiries on the upcoming Visit Nepal Year 2020 campaign. H.E Ambassador Mrs. Ambika Devi Luintel, Deputy Chief of Mission Mr. Lekhnath Bhattrai and other officials of Nepal Embassy in Paris visited Nepal Pavilion and encouraged the Nepalese delegation during the fair. 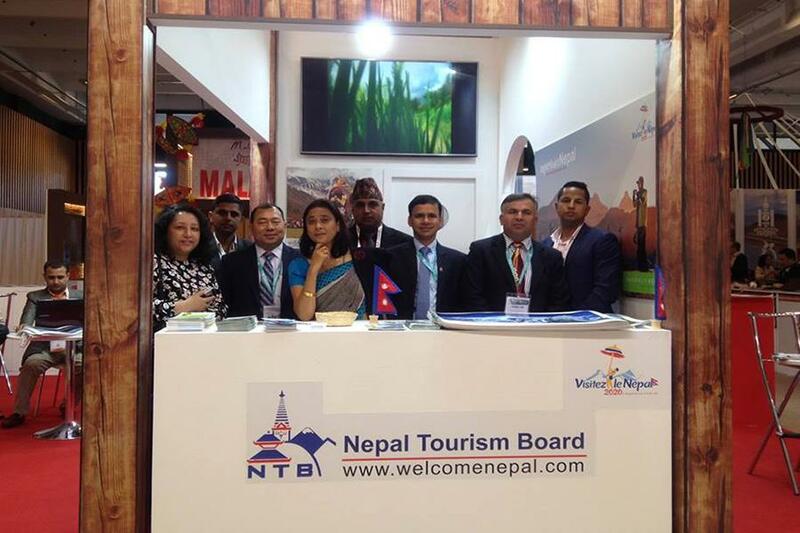 Mr. Ghanashyam Upadhaya (Joint Secretary) from MoCTCA, Mr. Kashi Raj Bhandri (Sr. Director) and Mr. Lila Bahadur Baniya (Sr Manager) from Nepal Tourism Board represented Nepal at the fair. Nepal Tourism Board also attended the 7th World Trails Conference of World Trail Network held in Santiago de Compostela of Spain between 26-29 September and bagged the opportunity to host the next edition of World Trails Conference in Kathmandu in 2020. Subsequent to the presentation on the Great Himalayan Trails, and several rounds of discussions the Board of World Trails Network has decided to host the next conference in Nepal. The Chairman of World Trails Conference and Mayor of Santiago de Compostela jointly handed over the flag of the next conference to Mr. Kashi Raj Bhandari. The opportunity to host the World Trails Conference in 2020 in Nepal is expected to reinforce Nepal’s image as the leader in trekking tourism and to be instrumental in attaining the goal of Visit Nepal Year 2020.